This premium monitor from Asus is reduced to £475 at Amazon UK right now. It's always a good time to update your monitor such is their value (a decent one can see you through several upgrade cycles), and this offer might offer a very tempting means to do so. Over at Amazon UK right now, the Asus ROG Swift PG278QR is only £475 right now. This is its lowest ever price in the UK and offers a total bargain. 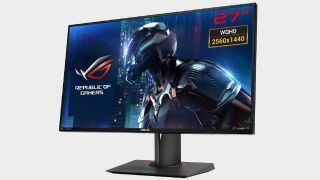 It's a very close relative of the monitor that sits atop our best gaming monitor list—the Asus ROG Swift PG279Q—and shares in many of that monitor's greatest qualities. These include a refresh rate of up to 165Hz, the sweet spot of 1440p resolution, and G-Sync, but differs slightly from it by having a faster response time of only 1ms and the difference in panel type, deploying a TN instead of an IPS. As one of Asus' ROG Swift range of monitors, there is a reliable and demonstrable level of gaming pedigree infused into this monitor so you'll know you can rely on it. And if you had your eye on the PG279Q but couldn't quite afford its higher price tag, then this is a genuinely brilliant model to go for instead.